Jazz Guitar Chord Theory - How To Construct Jazz Chords? 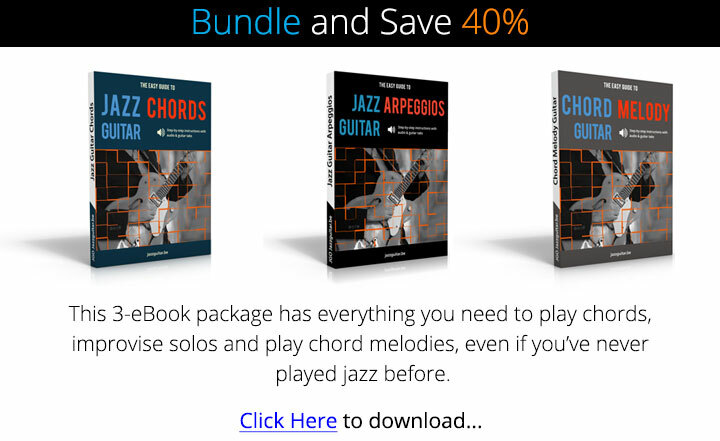 Home Chords Jazz Guitar Chord Theory – How to Construct Chords? 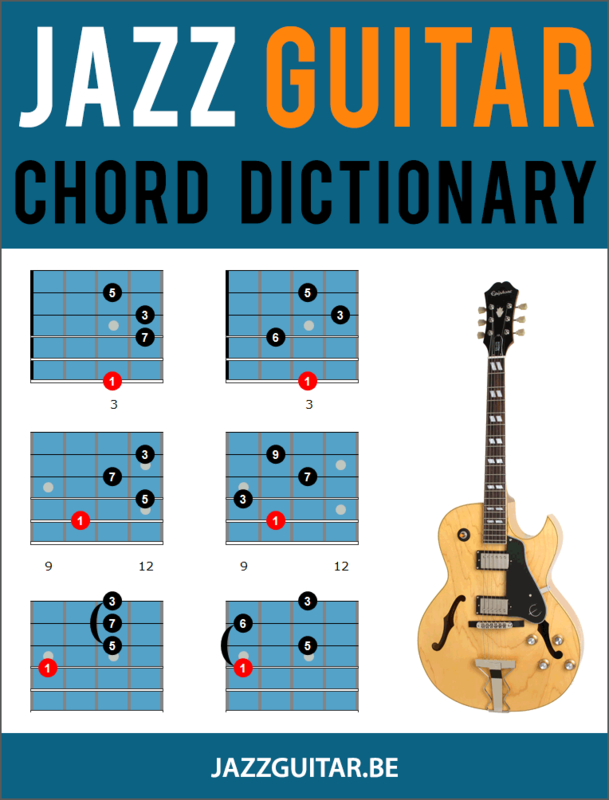 What are jazz guitar chords? How are jazz guitar chords built? What makes a chord minor or major? In this lesson, you will learn how to construct jazz guitar chords. Learning the (relative) simple theory behind chords will make your life as a jazz guitar player a lot easier and is essential when learning how to play guitar chords, so let’s dive straight in! To get started, we begin with a scale we all know, the C major scale. The 7 notes in this scale are numbered, these numbers are important (they are like a formula). The result is a C major triad or C (a triad is a chord that contains 3 notes). Every major chord has this structure: first a major third, then a minor third. A chord like this is called major because there is a major 3rd (4 half steps) between the root and the 3rd. The result is a D minor triad or Dm. Every minor chord has this structure: first a minor third, then a major third (the mirror of a major chord). A chord like this is called minor because there is a minor 3rd (3 half steps) between the root and the 3rd. Important: the b (aka flat) before the 3 means a half tone lower (than 3). Further in this tutorial we’ll encounter a # (aka sharp), which means a half tone higher. A half tone on the guitar is 1 fret. The result is a B diminished triad or Bdim. Every diminished triad chord has this structure: a minor third and another minor third. These chords are called the diatonic chords of C major. 1) Find the major scale of a given key. 3) Apply the minor chord formula to the major chord. The chord formula for minor chords is 1 b3 5. Example: This means the 3rd of the major chord (G B D) has to be lowered half a step. This is because in a minor chord (1 b3 5) there is a b in front of the 3, meaning the 3 is a half tone lower than the 3 in the major chord (1 3 5), where there is no b before the 3. Making the 3 (B) a half note lower is done by placing a b behind the note, like this: Bb (aka B flat). This is a bit confusing because in formulas we place the b before the note, but with actual chord tones, we place the b after the note. At the left are the 3 notes of G (1 3 5 = G B D). Let’s have a look at seventh chords. Seventh chords are chords that contain 4 or more different notes and are the bread and butter of jazz music. The construction of seventh chords follows the same principle as constructing triads: stacking thirds on top of each other. Triads were made by stacking 2 thirds on top of the root. Seventh chords are constructed by stacking 3 thirds on top of the root. The result is a C major 7 chord (Cmaj7). From C to E is a major third. From E to G is a minor third. From G to B is a major third. Every major 7 chord has this structure: first a major third, then a minor third, followed by a major third. The result is a D minor 7 chord or Dm7. From D to F is a minor third. From F to A is a major third. From A to C is a minor third. Every minor 7 chord has this structure: first a minor third, then a major third, then a minor third. The result is a G dominant 7 chord or G7. from B to D is a minor third. Every dominant 7 chord has this structure: first a major third, then a minor third, followed by another minor third. Learn more about dominant chords in this lesson: What Is a Dominant Chord? The result is a B half diminished chord or Bm7b5. Every half diminished 7 chord has this structure: first a minor third, another minor third, followed by a major third. Now that we know how seventh chords are constructed, we’ll focus our attention on tensions in the next section. Tensions (aka extensions) are notes that are part of a chord, but are not chord tones (1 3 5 7). First of all, there is something we call avoid notes: notes that are a half tone above a chord tone. Avoid notes sound dissonant, that’s why they are generally avoided.The 4 of the C major scale (f) is a half step above the e (the 3rd of Cmaj7). So the 4 (f) is an avoid note for Cmaj7 and is not often used on this chord. The 6 is also a special case in combination with major chords. Most of the times when we add a 6 to a major chord, the 7 is omitted and there is no octave added to the 6. This is because the 6 and 7 get in each other’s way. The same goes for 6 in combination with minor chords: the b7 is omitted. If we add the 6 to Dm7 we get Dm6. Note that the 6 is no longer A like in the C6 example above because the root of the chord changed to D. The 6 is now B (D E F G A B C). The 4 is not an avoid note in combination with minor chords because it is two half tones above the b3 and not one half tone. The 4 is also a special case in combination with dominant chords. When a 4 is added to a dominant chord, the 3 is omitted. Chords like these are called sus4 chords and often function as a delay for a dominant chord. There’s also something called altered tensions (b9, #9, b5, b13). These tensions come from the harmonic minor scale or from the altered scale and will be covered later in another lesson. The same for goes for #11, which comes from the Lydian dominant scale. Here’s a summary of the chord formulas we covered until now + some additional chord types. Earlier in this lesson you learned a first method to construct chords. Now you’ll learn a faster and more practical method. You must be able to picture the chord types, chord tones and formulas of C major without thinking. Now that you know the chords of C major, it’s easy to find chords of other keys. Adapt the chord tones of Cmaj7 to the formula of minor 7: bring the 3 and the 7 a half step down. Now you know how to find the notes of a chord, but how do you translate this to the guitar? 3 and 7 are the important notes of a chord because they determine the chord type. They are also important for voice leading. The 1 is the least important note, because it is usually played by the bass player. The 5 is not so important either and can be disturbing sometimes. Tensions add color and interest to a chord, so it’s preferable to use tensions instead of 1 and 5. The second thing you need to know is that 1 half step equals one fret on the guitar. You see that it is OK to duplicate chord tones, like the 1 and the 5 in our example. Instead of duplicating the root on the G-string, we exchanged it for the 7 of the chord. We exchanged the 5th on the D-string for the 3rd and we changed the 3rd on the B-string to a 9. A chord inversion is a chord that doesn’t have its root as its bass note. First inversion: the 3rd in the bass. Second inversion: the 5th in the bass. Third inversion: the 7th in the bass. What do you need to do if you want to make this chord dominant? Simple, just look at the chord formulas: the 7 has to go a half step down (major is 1 3 5 7, dominant is 1 3 5 b7). Thanks a lot Dirk for this lesson ? I scored 60%. Wonder if you can show the answers some time in the future. Thanks Dirk. I studied EIS (equal interval system, Lyle Spud Murphy) so I might be in contention with the diatonic system. I’m skeptical on the scoring (and can’t see the answers, so …). I’m pretty sure there was no correct answer to one question — I think it was the spelling of a D7b9 chord. It should have been DF#ACEb but the only choices were DF#ACE (not Eb) and DF#ACDb (also not Eb). I take it that there were 10 questions. I got 90%, so would be interested to know which one I got wrong. I strongly suspect it was the augmented 7, which I chose 1,3,#5, b7. As I went straight to the quiz, I didn’t read the body of the text, so there are different ways of writing chord symbols. I would also like to know where I went wrong. Fun quiz, though. A surprising 90%! Would be nice to know which was the wrong one. 9) F sounds dissonant on a Cmaj7 chord. 10) True: if you raise the root of a Cmaj7 chord with a half step, it becomes a C#m7b5 chord. Great lesson! Thanks! God bless! Really good lesson. A lot for me to take in so still working on it. Promise i won’t look at the answers to the quiz. Full disclosure….i am music theory challenged (why not label notes A through L and jettison those evil # and b things?) it would be helpful to me when starting the lesson to have a chart showing all steps between notes….so when we count 4 half steps from B it doesnt go CDEF….but BCC#D…i guess the lesson assumes the student knows there isnt a B# nor an E#…. Guess i need a more basic lesson…. Very very good lesson which will give me, a beginning jazz enthusiast, much information to go over and learn. Thank you, much appreciated! Very good lesson but no mention of sus2 chords. Do these have no place in jazz ?. Also, the so called Steely Dan chord 1235. Thanks. Your explanation is very well out lined. It is getting it into a old brain, as mine is and breaking those long etched in patterns . of cord placement and when and were. As most music is by tone of what is being played and in proper order as Jimmy Hendricks never followed and wowed the world. As so many others did also. this really helped me to understand how chords are built and what the different ‘tokens’ in a chord name mean. MANY THANKS! However I think one statement is actually confusing (if not wrong). Hi Jürgen, thanks for the feedback! What that phrase means: in formulas, we use 1 b3 5 b7 (b before note degree). In actual chords, we use G Bb D F (b after note). The b in formulas doesn’t always mean a distance of three halftones. In 1 b3 b5 b7 for example, there are 4 halftones between b5 and b7. The b in formulas is always relative to the major scale.